Let us all salute President Obama. Salam USA, and God Bless America. ‘ Muslims are being addressed by the US President as One Nation’. Why Pakistan failed to establish Equality & Peace ? How Ritualistic Prayers & Traditional Religion blocked Quran’s magnificent program of brotherhood—- Equal sharing of Food & Comforts of Life. The Masjid functioned as the prime headquarter of the Islamic State. All schools, offices, hospitals and buildings of the Islamic State were called a Masjid. What is not a Masjid ? A building used for superstitious religious rituals. Such Masjids become the home of Terrorism. The Quran condemns such Masjids. 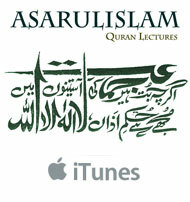 Listen to Asarul’Islam’s full lecture delivered on Shalimar Radio Los Angeles, California. Shalimar Radio Los Angeles must not die! The Radio station is is one of the few voices in the entire Islamic world that preaches the ideology of the Quran. It is facing financial hardships. Your contribution is needed NOW! An Islamic State without Mullahs. This is the ideology from the Quran. What is more? Please join the Community Forum and share your thoughts.